It’s been long since I have posted a review. I hardly followed a skincare regime for the past few weeks (guilt) so I couldn’t post any review since I can’t review a product without using it for at least continuous 10 days. 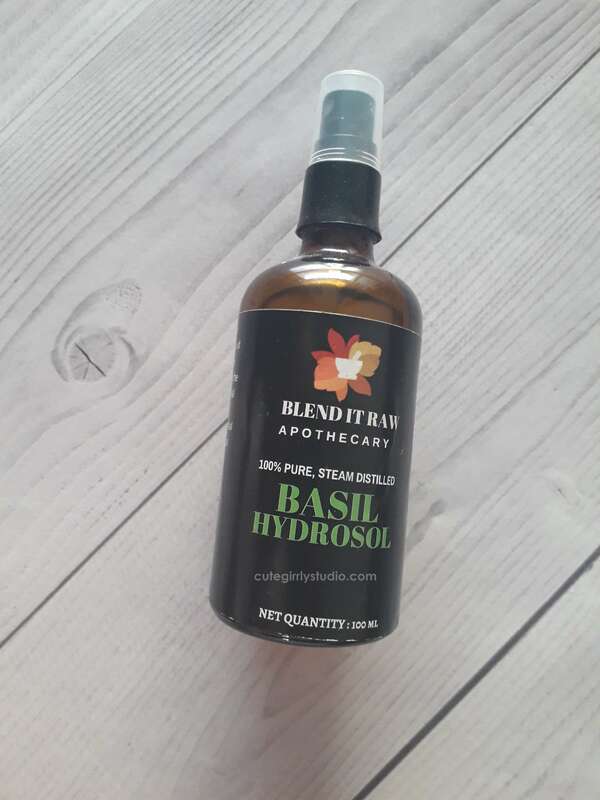 Today I’m gonna review Blend it raw apothecary Basil hydrosol. I love hydrosols, they help to tone our skin and actually helps to tighten the pores. After emptying my Juicy chemistry lavender water, I bought this basil hydrosol along with some other products from blend it raw apothecary since I have heard really good reviews about the brand. A little disclaimer here, this is not a sponsored review. 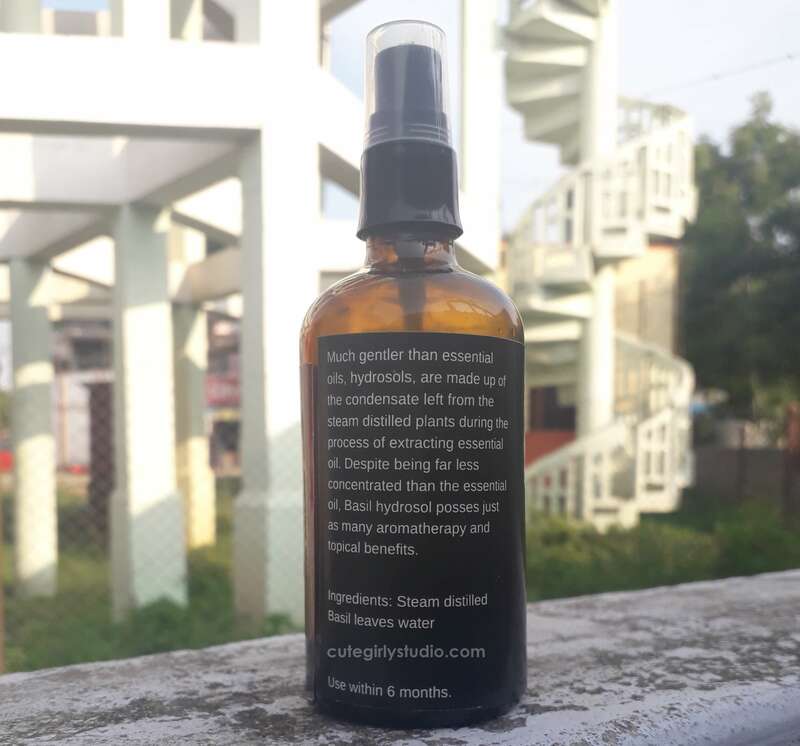 The brand focuses on DIY skincare and Haircare. The founder Aarushi is also a blogger. She blogs at glitternaturally.com. She loves whipping up face masks and so you can find various powdered flowers and herbs on their website. Their products are known for their quality. Almost all of their products have received numerous positive reviews. 400 INR for 100ml. Buy it from here. The hydrosol comes in a good quality amber glass spray bottle. This might be a con for some but I actually love glass packaging. Glass packaging might not be travel-friendly but it is definitely eco-friendly and preserves the quality of the hydrosols. Since I loved lavender water, I planned to buy lavender water from this brand. 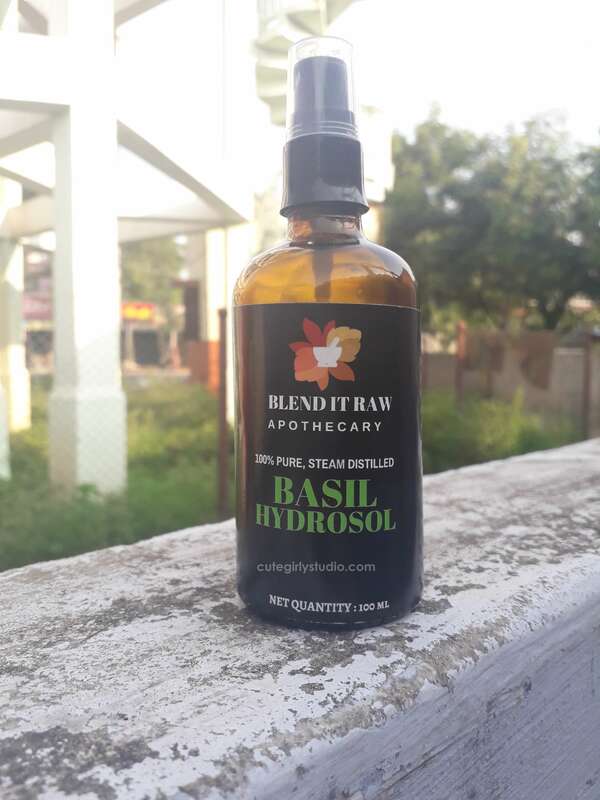 But after reading the benefits of each and every hydrosols, I ended up buying basil hydrosol since it is supposed to help with oily acne prone skin. I started using it from the day I received it. 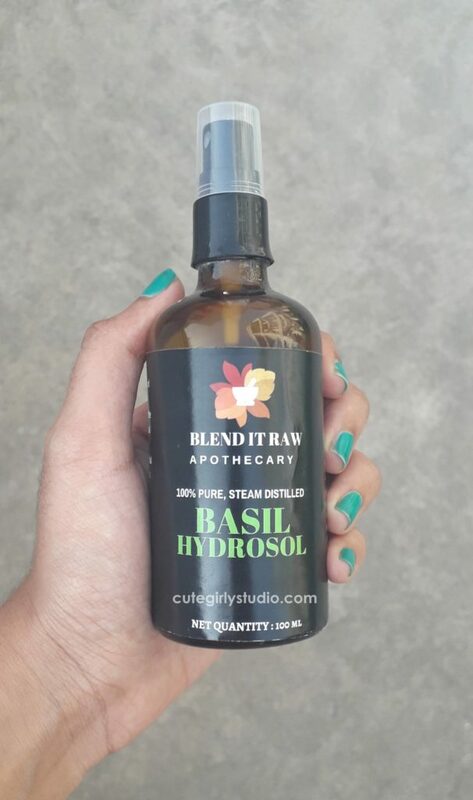 After cleansing my skin, I spray basil hydrosol all over my face and follow up with moisturizer to lock up the moisture. Basil hydrosol actually helps to clear up the skin. It clarifies the skin. My skin reacted badly to a night cream and this helped to clear up my skin faster. One thing that I noticed is it stings the area around my eyes. So I don’t use this around my eyes. This hydrosol is pure and not at all diluted. You will realize this fact once you open the cap of the bottle. I have used this to treat my itchy scalp also. Recently I tried a new shampoo and it left my scalp extremely dry and itchy. I used this basil hydrosol and it helped to treat that itchiness. It also acts as a scalp purifier. I used this in my detoxing scalp hair mask and it works fine. I have almost emptied the hydrosol and I love how potent this little baby is. It treats right from itchy scalp to smelly feet. I’m experimenting with my very own distilled floral waters these days and you can expect a DIY version soon on my blog. I don’t think that it suits extremely sensitive skin. Their rose water will be the best choice for sensitive skinned beauties. That’s all guys… Have you tried products from this brand? If yes do share your experience .